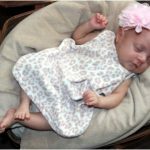 In our July edition of our Preemie Family newsletter we learned about 26-week, 2 day preemie Roxanne. Roxanne was born at 1 lbs 12 oz. and spent 96 days in the NICU before being discharged to home. Read more in an update by her mother, Amanda, below. While on a family vacation to celebrate our first daughter, Ryleigh, becoming a big sister and last trip as a family of three to the Monterey Bay Aquarium, I started to not feel well in our hotel room with extreme cramps. We quickly jumped into the car to try and make the three hour trip back home, but only made it half way there before having to pull off the freeway to the nearest hospital. Not knowing how severe things were, I calmly checked myself in through the Emergency Room. Within minutes they had me checked into a labor room and I was told my water had broke and I was 4cm dilated. The hospital we were at did not have a level 3 NICU so they tried to stop my labor and discussed transferring me to a near hospital with a higher level of infant care. Unfortunately, my labor did not slow down one bit and it was decided I would deliver at the current hospital and have the baby transported shortly after delivery. A few short hours later and three simple pushes I delivered Roxanne Jean Holster at 26 weeks, 2 days on October 16, 2015 at 1:52 p.m. Roxy weighed 1lb, 12oz and was 13 inches tall. A team from Kaiser Walnut Creek came to get her and took her back to their hospital that night. Having her leave was the first hardest step I had to take in this journey. However, the neonatologist himself came to get Roxy and also took time to talk with me prior to their departure. They told me I could call the NICU anytime and however many times I wanted. While calling over and over again would be excessive, let me just tell you they honestly don’t mind if you call a million times. One of the greatest things about all the nurses in the NICU is that they will talk to you on the phone however many times you wish, want, or need to. Of course I did not call a million times, but just want to point out that you should never be afraid to call or feel you have called too much. If your mama gut tells you to call, then do it! For recovery purposes I stayed at the current hospital and was discharged early the next morning. Being that we were almost 2 hours away from home, the hospital allowed me to board in a hospital room during Roxanne’s stay in the NICU. Boarding is always an option for NICU parents as long as they have an open bed. When Roxanne was 32 weeks gestational we had her transferred to a hospital closer to our home so that I could go back to work and be home with our older daughter. Roxy spent a total of 96 days in the NICU. During her NICU journey she encountered one blood transfusion, two ambulance rides, three hospitals, four different ventilator machines, and countless number of apnea and brady episodes, blood draws, and tests. Roxanne Jean got to come home on her exact due date and Daddy’s birthday at 40 weeks gestation. She is doing amazing and has proven to be a true miracle. 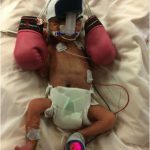 She currently is in the 50 percentile compared to other preemies and not even on the charts compared to full term babies. We expect her to catch up to her peers within two years or so. She came home with slight edema and an umbilical hernia that should correct itself within two years. If the hernia does not correct itself she will have a minor procedure to have it tucked in. Overall Roxy came home like any other full term baby and is loved by all. We will be seeing a team of specialist to check up on Roxanne’s growth in the coming months, but do not need to see any other specific care provides other than her primary pediatrician. 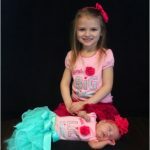 She has the best big sister in the whole world that loves her more than she will ever know! This journey will forever be a part of both our lives and has changed me for the better. Through this I have learned how to take each moment as it is and focus on the positive. I also learned how to accept help from others. Through this journey we had an abundance amount of help and support from our family and friends that I will forever be grateful for. In addition to all the support from our friends and family, I had a mentor who had gone through the experience of having preemie twins in a NICU. Talking to someone with an outside perspective that truly knew what I was going through was one of the biggest things that put my mind at ease as well as comforted my feelings. We truly could not have done this without our village! This experience has taught me patience and the importance of loving every minute of your life and to not take anything for granted. While these past few months have been some of the longest months of my life, they are just a small part to the beginning of our sweet dear Roxy’s journey in life. Amanda, you Roxie, Ryry, and Daddy were in my prayers constantly. My friends and family also held you up in prayer. I thank God for the miracle that brought this baby home healthy and happy.